Background: Sarcoidosis is a systemic disease, characterised by non-caseating granulomas in various organs. Liver involvement is not an uncommon feature of sarcoidosis. However, firm data establishing the clinical features and prognosis in these patients are lacking, although the incidence of liver sarcoidosis is high. In this study, we aimed to investigate the features of liver involvement in patients with sarcoidosis. Another aim was to evaluate the prognostic significance of liver disease by comparing the differences between patients with no liver involvement, limited and diffuse liver involvement. Methods: We conducted a retrospective study to evaluate the clinical and laboratory findings of 271 sarcoidosis patients seen at our institution. Patients with liver sarcoidosis identified by liver biopsy were compared to patients without liver involvement for clinical features and prognosis. The biopsy sample was considered positive if it demonstrated non-caseaiting granulomas with negative fungal and mycobacterial cultures. The patients were classified into three groups according to the radiological and histopathological biopsy results: no liver involvement; limited liver involvement: two sites positive; and diffuse liver involvement: three or more sites positive for granulomas. Results: Hepatic involvement was identified by biopsy in 81 (81/271, 29.8%) while 43 (43/271, 15.8%) patients had elevated liver function tests. Most of the patients (94.6%) had lung involvement. Other organs involved, in the order of frequency, were: lymph nodes, skin, eye, spleen and parotid gland. There was no significant difference between the three groups for forced expiratory volume in one second, forced vital capacity, total lung capacity, diffusing capacity of the lungs for carbon monoxide/alveolar volume, serum and 24-hour urinary calcium levels. Serum angiotensin-converting enzyme levels were significantly higher (p<0.01) in patients with diffuse liver involvement than patients with no or limited liver disease. Progressive disease was more frequent (p<0.01) in patients with diffuse liver disease. Extra-pulmonary organ involvement was significantly different between the three groups (p<0.01). Conclusions: Diffuse liver involvement in sarcoidosis is a significant risk factor for progressive disease. Patients with diffuse liver disease have a worse prognosis than patients without or with limited liver involvement. Diffuse hepatic involvement in sarcoidosis is also associated with an increased incidence of extra-pulmonary organ involvement. Presence of diffuse liver disease may reveal a severe prognosis for sarcoidosis patients. Halil Yarnadag, Cuneyt Tetikkurt, Muammer Bilir and Sabriye Demirci have nothing to declare in relation to this article. No funding was received for the publication of this article. Compliance with Ethics: The study has been approved by the institutional review board/ethics committee of Cerrahpasa Medical Faculty and each patient had provided informed, written consent. Patients fulfilled the American Thoracic Society (ATS)/European Respiratory Society (ERS) criteria for sarcoidosis. All procedures were followed in accordance with the responsible committee on human experimentation and with the Helsinki Declaration of 1975 and subsequent revisions. Sarcoidosis is a chronic systemic disease of unknown origin that is characterised by the formation of non-caseating granulomas in the affected organs, predominantly in the lungs and the intrathoracic lymph nodes.1–3 Non-caseating granulomas most often appear in the lungs and lymph nodes, but virtually any organ can be affected. Sarcoidosis of the gastrointestinal tract is extremely rare. In contrast to these organs, liver follows lung and lymph nodes in the frequency of involvement. About 50–79% of liver sarcoidosis is diagnosed by biopsy, while 67–70% is identified by autopsy.4–7 Although liver involvement is frequent in sarcoidosis patients, data relevant to the clinical characteristics and prognosis of such patients are scarce. The aim of our study was to investigate the clinical features of liver sarcoidosis. Another objective of our study was to assess the significance of liver disease in regard to prognosis and extra-pulmonary organ involvement. Therefore, we undertook a retrospective study in patients with sarcoidosis to characterise the clinical aspects and outcome of limited and diffuse liver disease. A total of 271 patients with sarcoidosis attending our centre between January 1988 and March 2015 were evaluated retrospectively for liver involvement. The study has been approved by the institutional review board/ethics committee of Cerrahpasa Medical Faculty and each patient had provided informed, written consent. Patients fulfilled the American Thoracic Society (ATS)/European Respiratory Society (ERS) criteria for sarcoidosis.1 All subjects underwent pulmonary function tests, diffusing capacity of the lungs for carbon monoxide/alveolar volume (DLCO/VA) tests, chest X-ray, thorax computed tomography (CT) and fiberoptic bronchoscopy (FOB). Laboratory investigations included complete blood count, liver function, renal function tests, serum calcium, 24-hour urinary calcium, erythrocyte sedimentation rate, C-reactive protein and angiotensinconverting enzyme (ACE). Abnormal liver or renal function tests, high serum ACE, hypercalcaemia and hypercalciuria were considered to be present if they were above the normal range. Chest roentgenograms were staged according to the DeRemee as follows. • Stage I: bilateral hilar lymphadenopathy. • Stage II: bilateral hilar lymphadenopathy and parenchymal involvement. • Stage III: parenchymal involvement only. Spirometry was performed according to the ATS/ERS recommendations. DLCO/VA was measured with the single-breath technique and was adjusted for alveolar ventilation. The pulmonary function tests and DLCO/VA were interpreted in accordance with the guidelines of ATS.9 Values for the pulmonary function tests and DLCO/VA were considered abnormal if they fell outside the 95% confidence interval for the predicted values. The evidence of restrictive (reduced total lung capacity [TLC] or forced vital capacity [FVC] and normal or high forced expiratory volume in one second [FEV1]), or decreased diffusion capacity (DLCO/VA<80%) were considered abnormal. For evidence of skin and ocular sarcoidosis, all patients were screened by a dermatologist and an opthalmologist. Central nervous system involvement was considered to exist if neurological findings were positive, a lesion was confirmed by CT or magnetic resonance imaging (MRI) and diagnosed by a consultant neurologist. • diffuse liver involvement (DLI): positive liver biopsy. Diffuse hepatic involvement was identified by the presence of three or more granulomas, whereas patients with limited disease had fewer than three granulomas detected by ultrasound (US) and/or CT. Extrapulmonary organ involvement was classified into two groups as: fewer than three, and three or more organs involved. Ninety-four patients received corticosteroids, 16 patients received azathioprine and nine patients received methotrexate. Clinical, laboratory, pulmonary function test and radiology findings were first evaluated three months after diagnosis and every six months thereafter. Laboratory evaluation during follow-up included blood count, serum biochemistry, serum and 24-hour urinary calcium. Pulmonary function tests included FEV1, FVC, TLC, and DLCO/VA. Arterial blood gas (ABG) was done when necessary. The mean follow-up of patients was 106.4 ± 16.2 months. Scale variables were represented by mean ± standard deviation. Clinical findings and prognosis of patients with limited and diffuse liver involvement were compared to patients without liver disease. The χ2 test was used for categorical variables as appropriate. Logistic regression was applied to determine the effect of age, gender and hepatic involvement on prognosis. Kruskal–Wallis and Bonferroni corrected two-way Mann–Whitney tests were used for comparison of the groups. After checking for normality, analysis of variance (ANOVA) was done to compare the difference between serum ACE, serum calcium, 24-hour urinary calcium, pulmonary function and DLCO/VA of the three groups. All tests were two-tailed and a p-value lower than 0.05 was accepted for statistical significance. Analyses were done using software (SPSS 22.0 version). Medical records of 271 sarcoidosis patients were evaluated. 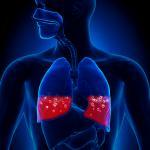 Initially, patients with suspected hepatic sarcoidosis were determined. Of these, 81 cases revealed granulomas by liver biopsy and 43 cases had hepatomegaly with increased levels of liver function tests (serum glutamic pyruvic transaminase [SGPT], serum glutamic oxaloacetic transaminase [SGOT], alkaline phosphatase [AP] and gamma-glutamyl transpeptidase [GGT]). Histopathological examination of the liver biopsy was positive and revealed non-caseating granulomatous inflammation in the biopsy proven cases. Table 1 shows the demographic composition of the patients. Smear or culture of bronchial lavage was negative for bacteria, mycobacteria and fungus in all of the patients. 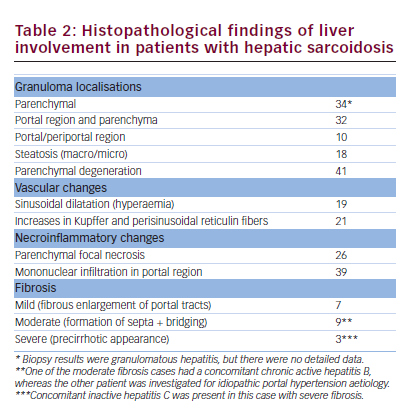 Histopathological findings of liver involvement in patients with hepatic sarcoidosis are shown in Table 2. Epithelioid histiocytes, Langhanstype giant cell and lymphocytes were observed most frequently in the granulomas. Histopathological evaluation of cases revealed the rate of focal fibrinoid necrosis to be 36%. Diagnostic tissue for sarcoidosis was obtained during FOB in 80%, in 28% by skin biopsy, in 18% via mediastinoscopy and in 16% by various organ biopsies. None of the patients had a complication associated with the biopsy procedures. 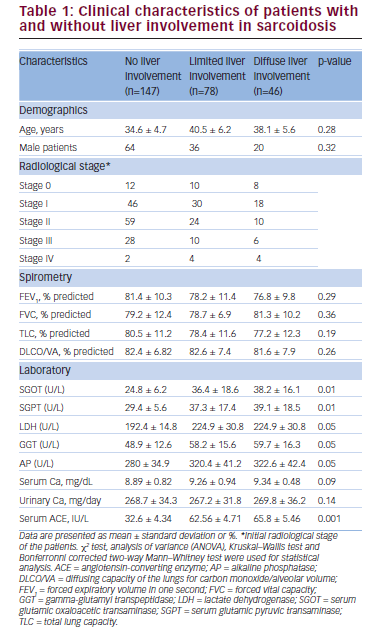 Clinical characteristics of the patients are shown in Table 1. FEV1, FVC, TLC and DLCO/VA were not significantly different between the three groups. Liver involvement cases were distributed as 12 cases (9.6%) in stage 0; 28 cases (22.5%) in stage I; 60 cases (48.3%) in stage II; and 24 cases (19.3%) in stage III. Results of the liver function tests are shown in Table 1. Initially, 142 patients (52.4%) with suspected hepatic involvement were determined; 81 cases were diagnosed with characteristic granulomas by liver biopsy while 43 subjects had elevated liver function tests and 18 patients had both hepatomegaly and high liver function test values with normal liver biopsies. Among the liver function investigations, SGOT and SGPT were the most frequent abnormal tests, followed by GGT and AP. Hypercalcaemia was observed only in four patients with liver disease (4/124, 3.2%) and serum calcium levels were 10.8, 11.2, 11.8 and 12.4 mg/dl (normal limit value: 8.5–10.5 mg/dl), respectively. Nine patients without liver involvement (9/147, 6.1%) had serum calcium levels above the normal range. Extra-pulmonary organ involvement (three or more) rate was 16.4, 20.6 and 34.8% in patients with NLI, LLI, and DLI, respectively. Logistic regression with Kruskal–Wallis test and Bonferroni-corrected two-way Mann–Whitney test revealed no significant difference on age and gender on prognosis. Differences between serum and 24-hour urinary calcium were not significant (p<0.32, p<0.28), while serum ACE was higher (p<0.01) in patients with limited and diffuse liver involvement (Table 1) compared with patients without liver disease. Logistic regression analysis revealed a significant severe prognosis for patients with limited liver involvement that was 3.6 times worse than the patients without liver disease (p<0.01), while the prognosis was 5.4 times worse in patients with diffuse hepatic involvement (p<0.01). Likelihood ratio of organ involvement (three or more) was also significant in patients with limited and diffuse liver disease compared with patients without liver involvement (p<0.01, p<0.01). even in patients with previous diagnosis of sarcoidosis.4 In the current study, hepatic involvement was present in 45.7% of sarcoidosis patients. We have observed that diffuse liver sarcoidosis leads to a more severe prognosis compared with patients without or with limited liver disease. Diffuse hepatic sarcoidosis appears to be a significant factor for progressive disease. The prognosis was approximately five times worse in the DLI group compared to patients without liver disease and three times worse than the LLI patients. On the other hand, the second aspect of our study was that extrapulmonary organ involvement was more frequent and severe in the DLI group compared to the NLI and LLI patients, contributing to the worse prognosis. Concomitant extra-pulmonary involvement rate was highest in the DLI group, followed by LLI and NLI patients. The most frequently involved organs were the lungs, skin and eyes. Neville et al. have reported a similar in frequency for concomitant extra-pulmonary involvement their study.10 This study clearly denotes that the higher the granuloma burden, caused by diffuse liver involvement, the worse the prognosis and the more severe is the extra-pulmonary organ involvement. This is supported by the fact that DLI patients showed the most unfavourable clinical implications compared with LLI and NLI groups. As the results of our study suggest, extra-pulmonary organ involvement also depends upon the burden of non-caseating granulomas. We are aware of the limitations of our study. This is a retrospective study with a small sample size. Further prospective studies including more patients with histopathologically diagnosed liver biopsy samples may be needed to define the limited and diffuse hepatic sarcoidosis more precisely, thereby enlightening the clinical features and the prognosis of these patients. The follow-up interval may be considered short, but it is well known that most of the prognostic risk factors for progressive disease become apparent within two years of diagnosis; follow up was approximately 10 years in our patients.20–22 Furthermore, although the clinicians were very experienced, the biopsy samples may be inadequate, may not represent the disease site and therefore may not identify the non-caseating granulomas. Diffuse liver involvement in sarcoidosis appears to be a significant factor for progressive disease. The severe prognosis is probably associated with the high granuloma burden in patients with diffuse disease. This finding is also supported by the raised levels of serum ACE levels, reflecting the high granuloma burden in these two groups of patients with limited and diffuse disease. Our results emphasise the significance of identifying diffuse hepatic involvement in regard to prognosis and a progressive disease. Positive liver biopsy and radiological investigations for the diagnosis of limited or diffuse liver involvement may be useful to predict the prognosis. The incidence of severe extrapulmonary is also significantly higher in these patients contributing to the worse prognosis. This finding is unique because previous studies have not reported that diffuse liver involvement would be associated with a progressive disease and a more severe extrapulmonary organ involvement. Clinicians should be aware that diffuse hepatic involvement may indicate a worse prognosis. 1. Statement on sarcoidosis, Am J Respir Crit Care Med, 1999;160:736–55. 2. Chapman JT, Mehta AC, Bronchoscopy in sarcoidosis: diagnostic and therapeutic interventions, Curr Opin Pul Med, 2003;9:402–7. 3. Lynch JP, Kazerooni EA, Gay SE, Pulmonary sarcoidosis, Clin Chest Med, 1997;18:755–86. 4. Ebert EC, Kierson M, Hagspiel KD, Gastrointestinal and heaptic manifestations of sarcoidosis, Am J Gastoenterol,2008;103:3184–92. 5. Hercules HD, Bethlem NM, Value of liver biopsy in sarcoidosis, Arch Pathol Lab Med, 1984;108:831–4. 6. Rose AS, Tielker MA, Knox KS, Hepatic, ocular and, cutaneosus sarcoidosis, Clin Chest Med, 2008;29:509–24. 7. Hunninghake GU, Costabel U, Ando M, et al., ATS/ERS/ WASOG statement on sarcoidosis: American Thoracic Society/European Respiratory Society/World Association of Sarcoidosis and Granulomatous Disorders, Sarcoidosis Vasc Diffuse Lung Dis, 1999;16:149–73. 8. DeRemee RA, The roentgenographic staging of sarcoidosis: historic and contemporary perspectives, Chest, 1983;83:128–32. 10. Neville E, Piyasena KHG, James DG, Granulomas of the liver, Postgraduate Medical Journal, 1975;51:361–5. 11. Baughman RP, Sarcoidosis usual and unusual manifestations, Chest, 1988;94:165–70. 12. Sharma OP. Vitamin D, calcium, and sarcoidosis, Chest, 1996;109:535–9. 13. Inui N, Murayama A, et al., Correlation between 25-hydroxyvitamin D3 1-alpha-hydroxylase gene expression in alveolar macrophages and the activity of sarcoidosis, Am J Med, 2001;110:687–93. 14. Baughman RP, Teirstein AS, Judson MA, et al., Clinical characteristics of patients in a case control study of sarcoidosis, Am J Respir Crit Care Med, 2001;164:1885–9. 15. Ackermann D, Hypercalcemia in sarcoidosis-case report, prevalence, pathophysiology and therapeutic options,Ther Umsch, 2007;64:281–6. 17:1272–80. 17. Wong VS, Adab N, Youngs GR, Sturgess R, Hepatic sarcoidosis complicated by hepatocellular carcinoma, Eur J Gastroenterol Hepatol, 1999;11:353–5. 18. Harder H, Büchler MW, Fröhlich B, et al., Extrapulmonary sarcoidosis of liver and pancreas: A case report and review of literature, World J Gastroenterol, 2007;13:2504–9. 19. Gupta S, Faughnan ME, Prud’homme GJ, Hwang DM, Munoz DG, Kopplin P. Sarcoidosis complicated by cirrhosis and hepatopulmonary syndrome, Can Respir J, 2008;15:124–6. 20. Judson MA, Baughman RP, Thompson BW, et al., Two year prognosis of sarcoidosis: the ACCESS experience, Sarcoidosis Vasc Diffuse Lung Dis, 2003;20:204–11. 21. Chappell AG, Cheung WY, Hutchings HA, Sarcoidosis: a long-term follow up study, arcoidosis Vasc Diffuse Lung Dis, 2000;17:167–73. 22. Judson MA, Baughman RP, Worsening of pulmonary sarcoidosis, Curr Opin Pulm Med, 2014;20:508–16.